Find out more about the Lorex High Definition Security Camera with Night Vision. Includes pricing, features, and frequently asked questions. The Lorex High Definition Security Camera with Night Vision is an affordable indoor/outdoor security camera from Lorex. The camera can be mounted on a wall or ceiling for surveillance purposes. High definition 720p security resolution. Pros: Durable exterior design. Convenient for wall or ceiling installation. Cons: Must be plugged in to receive power. Bottomline: The Lorex High Definition Security Camera delivers HD video footage and is suitable for a variety of security settings. What are some alternatives to the Lorex High Definition Security Camera with Night Vision? Where can I buy the Lorex High Definition Security Camera with Night Vision? You can purchase the Lorex High Definition Security Camera with Night Vision on Amazon, or on the Lorex website. How well does the Lorex High Definition Security Camera with Night Vision work in the dark? The camera is able to see up to 130 ft. in ambient lighting and up to 90 ft. in complete darkness. Can the Lorex High Definition Security Camera with Night Vision be used in any weather? 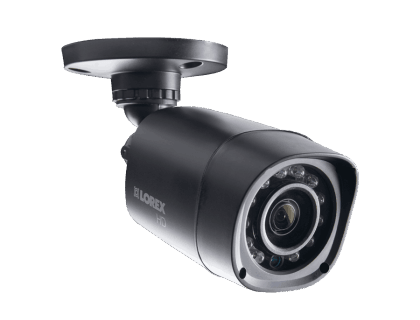 The Lorex High Definition Security Camera was designed to be weatherproof. It has an IP66 weather rating and can function in temperatures ranging from -22°F to 140°F.